I love this time of year, especially these last few days when the children have finished school, I've finished the shopping, presents and cards have been delivered, and most of the other preparation is done. 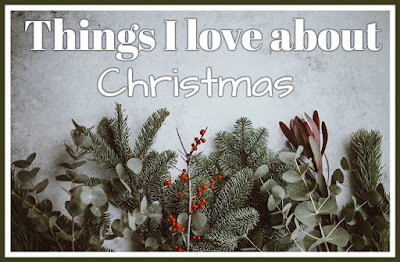 So I thought I'd write a nice festive post with all the things that I love about Christmas! Decorations - I love having the decorations up in the house. We have a gorgeous artificial tree, and the corner where it sits always looks so empty and bare the rest of the year. The mantlepiece looks much prettier with our homemade decorations on, and the banisters are the perfect place to display Christmas cards. Fairy lights - It's so much nicer to sit and watch television in the evening bathed in a soft twinkly glow. The Elf on the Shelf - I know, I know, he's not for everyone, but my children absolutely love getting up in the morning to see what the elves have been up to - even if all they've done is moved from one side of the room to the other. However I don't make a big thing about the children being spied on, and I don't share any photos to social media - it's just a bit of fun for the children! New traditions - Although most people celebrate Christmas all families have their own way of doing things, and it can take a few years to work out your own traditions. For example - presents before or after breakfast? Does everyone sedately open present at a time, or do you go for a massive paper flinging frenzy? All food cooked from scratch or pre-prepared? It's nice when you've developed familiar routines that work for your family and you can start your own traditions. The Gingerbread House - I'm not sure what inspired me to make my first gingerbread house (I suspect Pinterest) but since 2012 we've made them every year. We started off with one large house, then more recently I make two smaller houses for the children to decorate. I've found a recipe that works well and all sticks together nicely (you can read about how I make our gingerbread houses here) so they are easy to make and the children have a lot of fun with them. Christmas music - Christmas has definitely begun when you hear Fairytale of New York on the radio! We always have our Spotify Christmas playlist on when we decorate the tree, when we open the presents, when we eat our Christmas dinner and whenever we are doing anything festive. I also love singing Christmas carols at the school carol service and on the village green on Christmas Eve. The Nativity play - This year was probably our last traditional Nativity play, as the school have a carol service instead from Year 3. I've loved watching them over the years. Christmas food - I must admit that we've already made an excellent start on the Christmas chocolates (there's generally a box open throughout December) and I do love a mince pie or two. We don't have a massive traditional Christmas dinner, but we do buy special food like cheeses and crackers and I love roasted vegetables with different sauces. Finally, I think that my favourite thing about Christmas is all the memories from past Christmases. 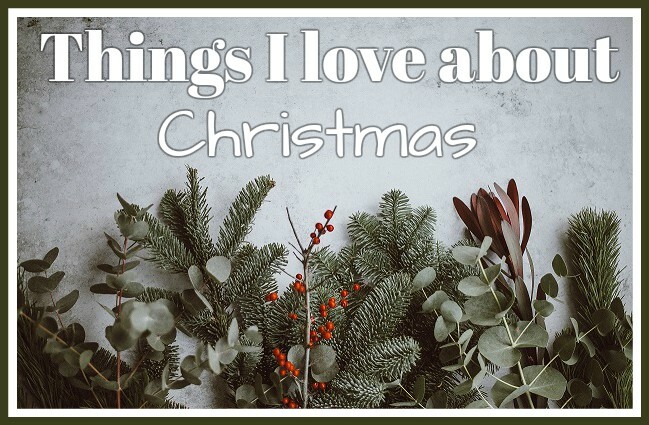 I have had so many happy times at Christmas in my life and it's lovely to have the memories triggered, whether by a particular song or carol, going to a certain place or eating a particular food.